The Perio Protect Method offers patients an individualized treatment plan to effectively fight bacteria that cause gum disease. "There isn?t anything else like this or that comes anywhere close to the efficacy of Perio Protect. Nothing. The entire process is designed to overcome shortcomings of all other systems," said a current Perio Protect Method customer who has been practicing dentistry for 21 years. Compared to similar systems offered by other manufacturers, all of the evaluators said the Perio Protect Method is much better. Space Maintainers Laboratories' Perio Protect Method is a comprehensive treatment approach to help manage biofilms associated with periodontal disease (gingivitis and periodontitis). It is a combination of treatments, including a noninvasive chemical debriding therapy used in conjunction with traditional mechanical debriding procedures. 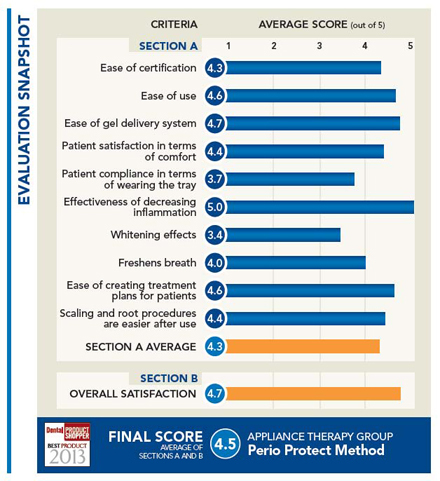 Seven current Perio Protect Method customers, with 12 to 41 years of experience in dentistry, participated in this Dental Product Shopper evaluation. Manufacturer Description: Using the Perio Protect Method, dentists can determine individualized treatment plan for each patient. Based on patient conditions, the Perio Protect methodology incorporates mechanical debridement (scaling and root planing) or laser-assisted removal of biofilms with patient delivery of prescribed medication into the gingival sulcus or periodontal pocket. Evaluator Feedback: An evaluator from California said the Perio Protect Method is "an excellent product and very easy to use." Another evaluator with 20 years of experience said that ease of use and ease of creating treatment plans for patients are both excellent. Manufacturer Description: Research shows that placing antibiofilm agents with oxidative/oxygenating properties into the pockets using a custom-formed prescription dental tray can reduce bacterial populations and result in decreased periodontal pocket depths. Evaluator Feedback: "Perio Protect works better than anything I have used for controlling periodontal issues," said a Texas-based evaluator with 21 years of experience in dentistry. Perio Protect Method's effectiveness of decreasing inflammation was the highest rated feature; all 7 evaluators rated it as excellent. In addition, 5 evaluators said this feature was what they liked best about the product. Manufacturer Description: As part of the method, dentists and patients work together to create homecare regimens. Evaluator Feedback: When asked what he liked best about the Perio Protect Method, an evaluator with 20 years of experience in dentistry said, "It gets patients involved in their therapy." When asked how the Perio Protect Method could be improved, an evaluator from Arlington, TX, suggested, "Make the trays and solution hypoallergenic." He went on to say he would definitely recommend the product to colleagues and contacts in the dental profession. In terms of Perio Protect Method?s patient compliance while wearing the tray, an evaluator with 40 years of experience said, "It works very well when our patients are compliant." Two evaluators commented that they would like to see patient compliance improved; both evaluators rated their overall satisfaction with the product as excellent. All 7 evaluators said they definitely would recommend the Perio Protect Method to colleagues or contacts within the dental profession. All 7 evaluators also said they would definitely purchase the Perio Protect Method in the future. A California-based dentist with 12 years of experience summarized his experience by saying, ?Perio Protect is an excellent product and is very easy to use."